Sadly, it's come to this... plow vs. plow, in a contest to see which machines are mas macho when it comes to completing the task of snow removal. But alas, I cannot allow the comments of D+R reader Moose Hunter to go unremarked. 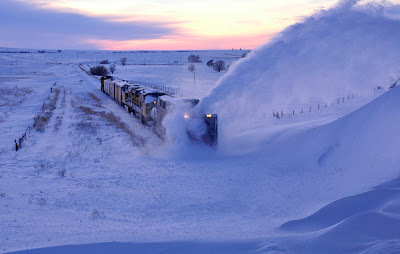 In a (playfully dismissive) response to my post about the machinery Caltrans uses to keep Interstate 80 open over Donner Pass during winter months, Moose Hunter pointed us toward a video of a giant pusher plow used to keep the tracks clear of snow on a railroad line that runs between Goodland, Kansas and Limon, Colorado. To which I can only say, "Feh." Yes, the railplow shown in that video creates a flashy rooster trail -- "an avalanche on train tracks," as Mister Jalopy so aptly put it. Yet I would call your attention to the amount of snow on the ground at the time when that video was taken: I estimate it's roughly 18 inches. Two feet, max. Well, in California's Sierra Nevada, that quantity of snow is called "a dusting." 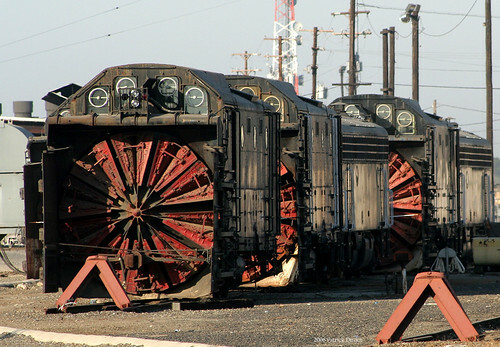 A bladed railplow works just fine when you're dealing with modest amounts of snow, but up on Donner Summit (named, of course, for the snowbound cannibals of the Donner Party), bladed railplows won't get the job done. On Donner Summit, snow routinely falls at a rate of two feet per day, for several days in a row. It's serious stuff -- as 222 hapless rail passengers discovered in 1952 when their train became stuck on Donner Pass in 20' snow drifts.